The maritime industry is changing. Watch our short video to hear about Inmarsat’s maritime vision in supporting the data revolution and setting a new standard in communications at sea. Early this month, Inmarsat confirmed that global commercial service introduction has been achieved for its new Global Xpress (GX) constellation. The constellation consists of three Ka-band, high-speed mobile broadband communications satellites. GX is the first high-speed broadband network to span the world, and Inmarsat says that its maritime functionality, Fleet Xpress, will make video a viable proposition for remote assistance and diagnostics and will enable advanced applications such as telemedicine and video surveillance. But the potential for very high availability has many ship management and safety applications and could ultimately include the potential for the safe deployment of unmanned vessels. Purposely designed for mobility, the new GX system will provide a continuous, consistent service as traffic is handed seamlessly across each spot beam and from one satellite to another. Global Xpress operates in the Ka-band, but, combined with the Inmarsat L-band network it is anticipated to deliver 99.9 percent overall network availability. Global Xpress will deliver broadband speeds that are an order of magnitude faster than our fourth generation (I-4) constellation, to customers on the move on land, at sea and in the air, globally. that is set to change the way we live our lives – watch the trailer to find out more. New communication capabilities that have very high availability will be an enabler for the real-time transfer of significant amounts data from ship to shore and vice versa, says DNV GL in its 2015 position paper Ship Connectivity. Potential applications include condition monitoring, remote maintenance, decision support tools and energy optimization such as those offered by engine manufacturers and system integrators, such as Rolls Royce, Wärtsila and Marorka. In the case of Marorka, the company’s on board system can log, track, and analyse more than 500 data sources, including fuel consumption, speed, weather and draft. The E.U. and the IMO are introducing regulations for monitoring, reporting and verification of emissions, and new satellite communications capabilities could aid in meeting these requirements by providing reliable, transparent data without unnecessary burdening ships’ crew. “If an advanced weather station is fitted on a vessel, relevant data may be transmitted regularly to an onshore data centre, for further analysis or data sharing. If many vessels participate, a network with continuous feeds of weather data from many locations would be created. Safety applications include the live monitoring of critical systems, says DNV GL. This could determine the integrity and status of various safety systems and alert shoreside personnel if, for example, fire detectors are offline, watertight doors are kept open too often or if ECDIS is using an obsolete version of maps. During emergencies, shore parties could benefit from additional data being transferred live from the vessel. They could keep informed of the status of the navigation system and safety systems (e.g. fire and flooding status), stability information from the vessel’s loading computer and possibly video streams from strategic positions on board the vessel. DNV GL also proposes VDR-in-the-cloud as a way of sending vessel black box data to shore on a regular basis in case the voyage data recorder is not found after an accident. Ultimately, the increased reliability and capacity of data transfer could enable the controlling of ship functions from shore. “Remote control of vessel functions will have intensive requirements regarding the communication link to the vessel,” says DNV GL. “Firstly, the connection needs broadband in order to be able to transfer sufficient amount of information to the onshore operator and back to the vessel. The bandwidth requirements for the forward link will be smaller as it will be mainly control commands from pilot to vessel. The provision of a robust and dependable communication link could be provided by redundancy and diversity where several independent communication systems are used. Backing up a satellite connection with a terrestrial connection, such as 3G or 4G, is another alternative. If communication is lost, a fail-safe logic could be applied, so that the autonomous system configures the vessel to the safest possible state until communication is restored. 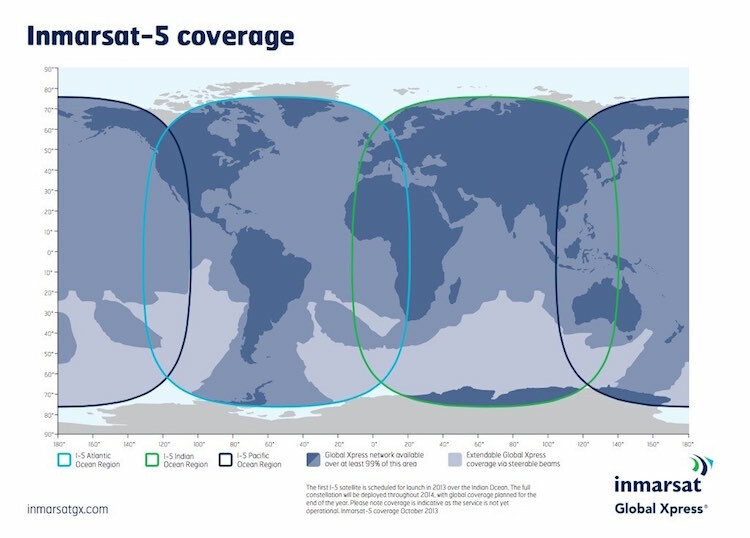 Inmarsat continues to build its capacity for VSAT service technology. A fourth GX satellite – Inmarsat-5 F4 – is currently completing construction and testing by Boeing in California. This satellite is now likely to be launched in the second half of 2016 in order to provide additional GX network capacity.